Cactus Flower Florists: Make it a White Christmas: White Hydrangea for $10! Make it a White Christmas: White Hydrangea for $10! OK, the chances of a white Christmas in the Valley of the Sun are pretty slim, but you CAN make your own white Christmas on your dining table or fireplace mantel using our December Fresh Ten special: Three stems of white hydrangea for just $10. Hydrangea are extremely easy to work with and don't require a lot of "extras" to make a beautiful arrangement. 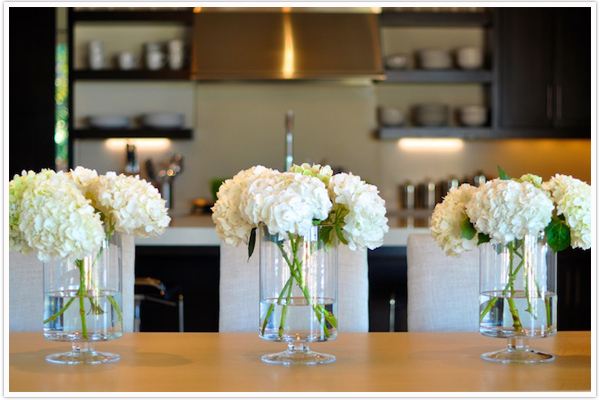 We give some examples below of DIY hydrangea centerpieces for the holidays. Idea #1: Simply place all three stems in a vase you have at home. In this example, we used a 5" cube. (We wrapped a stem of curly willow into the inside of the vase to create a "grid" to secure the hydrangea stems first.) Voila! You have an elegant, snowy centerpiece for $10. Idea #2: You can easily add a pop of color to your arrangement using red roses, tulips, or other red flowers. Simply insert them right into the head of the hydrangea. Idea #3: If you want to give it more of a Christmas feel, add some Christmas greenery from your Christmas tree, or pick some up at our store when buying your Fresh Ten bunch. Idea #4: Another way to add color to your arrangement is with ribbon. Make loops of the ribbon with wire picks. Insert three or more of them in the hydrangea for a festive touch. Idea #5: We love this hydrangea display. Isn't it breathtaking? Would you believe that there is NOTHING else to these centerpieces than hydrangea? There are four stems in each vase, so this would require four Fresh Ten bunches. That's only $40 for an amazing centerpiece display. 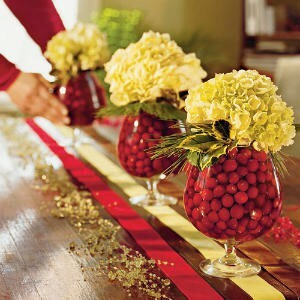 Idea #6: Finally, if you REALLY want to get creative, why not fill water glasses, cubes, small vases, or any clear container with cranberries and water, and then top it with a stem of your hydrangea and holly? Talk about festive! Your guests will be so impressed that you did this yourself. We hope that these ideas have given you inspiration to make your own Fresh Ten arrangement this holiday season. Click here for your nearest Cactus Flower store and pick yours up today! Find Your Inner Elf at Tinsel Training!